NVMe capable SSDs are growing increasingly popular these days, offering much higher transfer speeds than the usual SATA drive. New markets always offer new opportunities and that on the other hand means that different vendors will launch new products. ADATA is one of those having presented their new SX7100 NVMe SSDs. 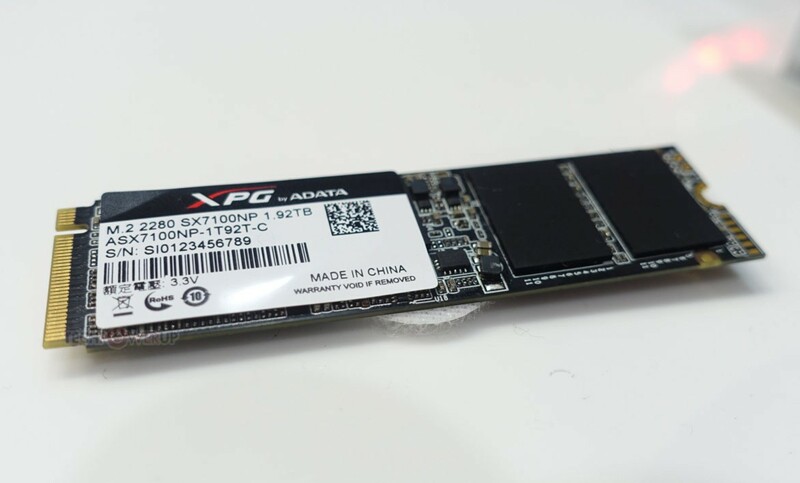 The new SX7100 NVMe SSD is going to be available with 120GB, 240GB, 480GB, 960GB and 1.92TB capacity and uses 3D TLC NAND memory. Like most NVMe SSDs out today, the SX7100 NVMe SSD makes use of the M.2 2280 form factor and a PCIe Gen 3.0 x4 interface and the NVMe 1.3 protocol. ADATA's SX7100 sports a new Marvell controller in order to ensure better performance as well as a higher TBW rating. Talking about performance, sequentially reading these drives should achieve up to 2'100MB/s and 1'500MB/s in the case of sequential writes. According to the manufacturer, the SX7100 series has an endurance rating of 2 million hour MTBF. Furthermore, the company has unveiled the first RGB SSD cooler. It's called Tornado, it should give room for up to two M.2 SSDs and a tiny fan with five speed settings. At the moment there isn't any picture or additional information of this device.